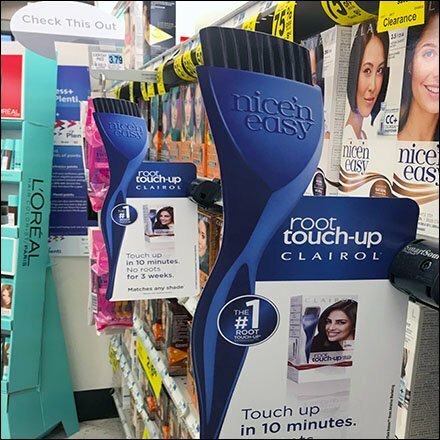 Nice ’N Easy uses Category Management as promotional tool with Hair Color Branded Category Definition via Die-Cut Aisle Invaders. The hair color process requires a touch-up brush, which makes a great die-cut dimensional visual for category definition. Aisle Invader outfitting is perfect for saying here-to-here is the product you are looking for, as well as communicating to shoppers up and down the aisle. The die cut emphasizes the touch-up brush and makes the promotion all the visible against a busy retail background. This Hair Color Branded Category Definition seen at RiteAid.